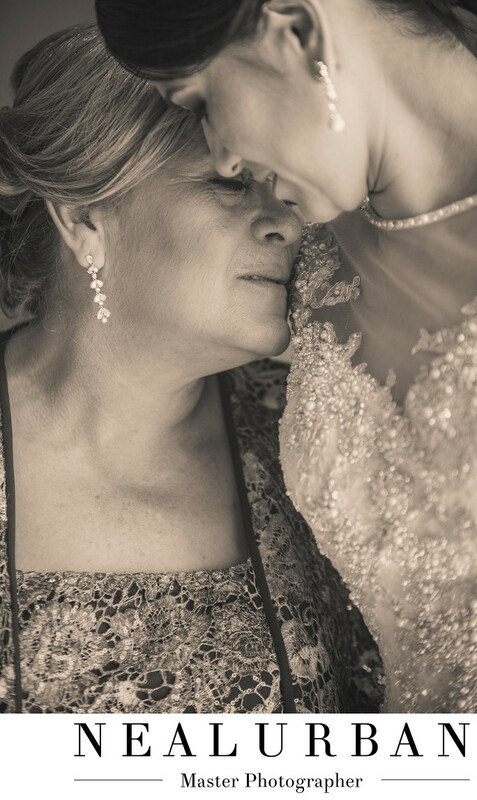 This was a beautiful mother daughter moment between Sylvia and her mom. We travelled to Puerto Vallarta, Mexico for Sylvia and Joe's destination wedding. Sylvia grew up there and wanted her wedding at home! They had their ceremony at Our Lady of Guadalupe Church. The reception was at the NOW Amber Resort. We all stayed there. This is where the bride and groom got ready as well! Sylvia had such a close relationship with her mother. This image was taken after Sylvia was in her dress. We brought mom in for some portraits with her daughter. We did some basic portraits with them looking at the camera. Then Sylvia pulled her mother in like this. The emotion in this photo is so powerful. We always have to be ready to take a photo. The best photos are the ones in between what we don't set up. If Neal had put his camera down after the first portrait we could have missed this! That is one reason we always have two photographers. There are moments and things happening constantly. We have to have eyes everywhere. One of us always has to have our eyes on the bride and groom. If Neal is looking for something artistic, I am focused in on something simple and safe. We do not want to miss anything. This image had to be turned black and white. Black and white brings out emotional moments even more. Black and white are also timeless images!